I must admit, when Wolford’s PR agency contacted me regarding a review for one of their core collections I jumped at the chance! Prior to this I own a few pairs of their illustrious luxury tights – which help me not only look chic but keep me super warm in the winter. All their boutiques exude luxury, and although it is a high-end brand with an accompanied price, you get what you expect and they don’t disappoint. Now lemme tell you somthin’ As soon as the package arrived at my work desk I squealed with excitement. From the elegant and eloquently packed-packaging I knew I was going to love it. I chose the ‘Holly Leggings’ to review as it is an essential part of their core collection and I just really wanted to see what the hype’s all about really. I have to say the quality was exceptional, just as you’d except from a high end specialist fashion brand; the leggings are so thick that they are even advertised on the site as ‘a wonderful alternative to tights’ – which I have to say is pretty true. They are luxuriously thick and a truly pigmented pair of leggings. Not only are they super comfortable to wear but you definitely get the feel that they have provided a wonderful balance in warmth, fit and of course, chic versatility. On this occasion I styled the leggings with my latest pay day purchase – a classic Zara polkadot shirt with a dainty neck tie detail. 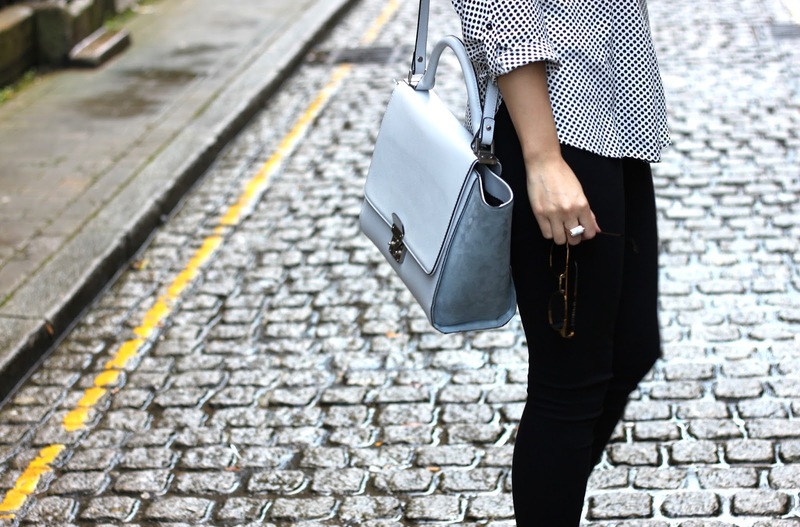 A lighter palette is used to compliment the leggings, from a baby blue shoulder bag to a white and marble effect style ring. However, if you don’t know yet; i love gold. I couldn’t help myself but match my accessories to my shoes, a pair of Jeffrey Campbell’s circa 2011-2012 which i’m still completely besotted with. Have you ever heard of Wolford and is it me or do you too have anything you can’t let go of in your wardrobe? "Zuso Clothing Event | The Old Blind School"
Love how you style this look hun! The boots are gorgeous, is your bag from Zara? 🙂 I used to worked for Walford when I was a student, haha.